100 Greatest Scenes Number 4: “Do You Expect Me to Talk? In a franchise that spans over 20 movies and 50 years, there was only one scene that made it into the Views from the Sofa top 100. It is iconic because it plays with a James Bond trope before it has even become a full cliché and staple of the series. The idea of Bond being stuck in an “inescapable” position, only to conveniently use a gadget to get himself out has been used in the movie series all the way to the most recent film: Spectre. This was a situation where it would take more than a gadget to get Bond out of what could be possibly his worse situation in the whole franchise. Greatest Scene Number 4: Goldfinger: “Do You Expect Me to Talk? It isn’t just because the trap is so horrific and impossible to get out of. Sean Connery didn’t have so many of the “inescapable traps” and he certainly didn’t escape as many, in such ridiculous ways, as Roger Moore did but this scene feels like it is playing with that idea, placing Connery’s Bond in a situation which truly is inescapable. It is effective because Connery sells it so well. He starts off arrogant and as cocky as usual but then as Goldfinger, played to full menacing evil by Gert Frobe, begins to explain the laser, Bond’s situation becomes clear. This is where Connery shows why his Bond is considered one of the best. He never truly panics, but his eyes, darting from laser to the exiting Goldfinger and back, is enough to show that our hero is worried. Beads of sweat form on his head as the laser slowly, really slowly, makes it’s way towards Bond’s sensitive area. It is a tense scene for anyone who doesn’t know the outcome. It also has one of the best exchanges between Bond and a villain. Goldfinger will make the classic Bond mistake and outline his plan in full detail later in the movie but here we get the now immortal line “do you expect me to talk?” which is then rebutted with a simple but effective “no Mr Bond, I expect you to die.” It is simple but clearly shows that Bond has no way out of this predicament. Except that is what you are supposed to think and when the solution to the problem does present itself, it is more clever than most Bond escapes in the franchise. 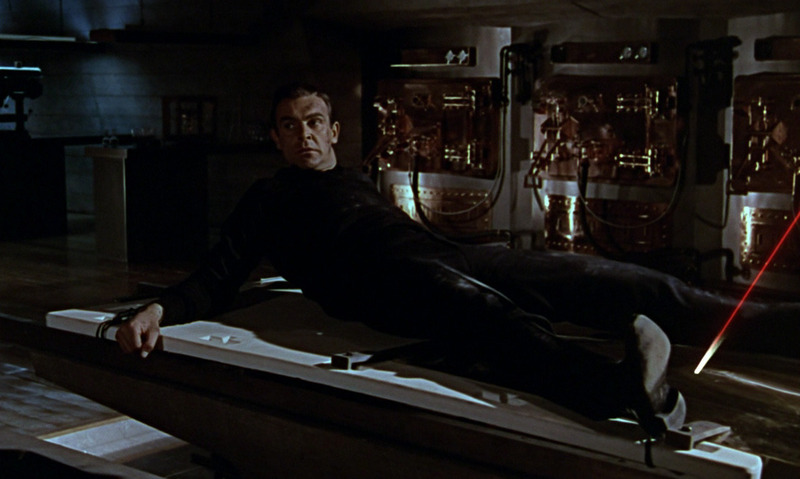 Bond’s first few attempts to “plead” with Goldfinger fall on deaf ears but when he mentions a phrase he has heard in passing, Goldfinger must consider his release. Goldfinger even calls his bluff but Bond demonstrates his steely resolve and manages to win-out, demonstrating why he will also win the day eventually too. 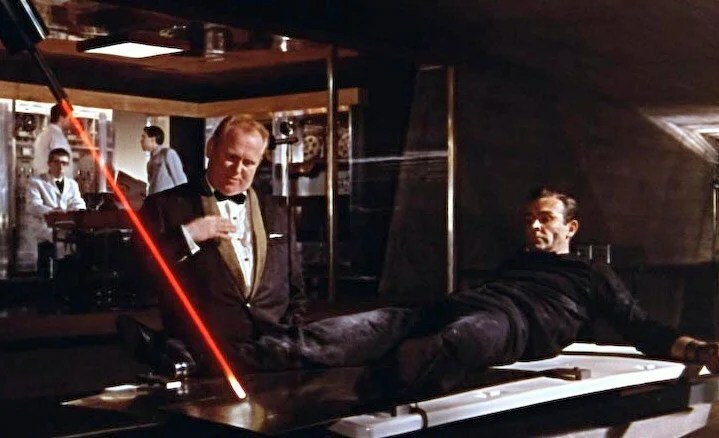 Overall, the laser scene in Goldfinger is a benchmark for the 50 year old franchise. It has suspense, a genuine scary and inescapable trap and a villain who is every bit as evil as Bond is suave. The solution to the problem makes sense too and doesn’t feel cheap like many that follow it will.